With little turnaround time after this national tournament, Tasha went to the Copper Bowl in Tucson Arizona along with Kadie, Allie, and Betsy. Tasha competed in a very close first round match against Jill Wollesen in the Girls 16s division, but was defeated in a close third set ending in a seven-point tie-breaker. She rallied to win the next three rounds in the consolation draw, and defeated Julie Bell, Elise Woulfe, and Joselyn Lu (whom she beat in a close three sets). After these tiring matches, she was defeated by top ranked Jenny Hois in the third round of the consolation. Allie played a competitive match against Julia Wiesel, and won 6-1, 6-3. Though she was defeated in her next two rounds in close sets, her overall performance was solid, and she gained many new experiences competing at this high national level. 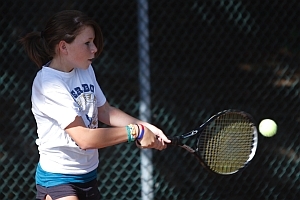 Kadie also gained new match experience playing at this level. She lost to Alexa Brandt, but was able to battle back and win her next match against Sachi Carlson. Although Kadie did not emerge victorious in her third match against Alexxis Kiven, she played two very close sets (7-6(3), 6-3), and kept fighting until the end. Betsy Sauer also competed in this event. As her first national tournament, Betsy was able to rise to the heat of the competition, and defeated Madison Mathis 7-5, 6-2 after she was defeated by Leighann Sahagun. Betsy lost to Emiley Meyers in her third match, but played very hard (as everyone does at the LTA). Overall, the Copper Bowl provided these players with new experiences that they have carried with them in the following local tournaments.